December 12 (Bloomberg) Promising no more business as usual, Mongolia's new Prime Minister Saikhanbileg Chimed said his priority is to resolve a dispute with the country's biggest foreign investor, Rio Tinto Group, over developing one of the world's largest copper and gold mines. In the midst of naming his new cabinet this week, Saikhanbileg met with the chief executive officer of Rio's copper division Jean-Sebastien Jacques for what were described as highly constructive and collaborative talks, according to a person familiar with the discussions who asked not to be named because the meeting was private. Saikhanbileg has brought other parties into his cabinet in an attempt to forge what he's called a Grand Coalition government of national unity. He's said he'll focus on fixing an economy that went from fast lane to braking hard, almost in lock step with the Rio conflict. The cabinet was announced on Wednesday in an English-language e-mailed statement from Mongolia's Ministry of Foreign Affairs, a communication which is itself unusual and may indicate a fresh approach to foreign investors. That may be welcome news to Justin Kapla, a U.S. businessman prevented from leaving the country for two years due to allegations of tax evasion. He hasn't been charged or jailed, just told he can't leave. Jacques will meet with other ministers this week including Minister without Portfolio Enkhsaikhan Mendsaikhan, the person said. Enkhsaikhan, a former prime minister, will have a role in advancing large projects in the country. He declined to comment on any possible involvement in negotiations about the disputed mine, known as Oyu Tolgoi or Turquoise Hill. Brian White, a spokesman for Oyu Tolgoi LLC in the capital Ulaanbaatar, declined to comment on any developments with Mongolia's new government. Between fighting with Rio and detaining Kapla, Mongolia managed to scare off investment and then watched as its economy went from fastest expansion in the world -- 17.5 percent in 2011 -- to also-ran -- 7 percent through the first nine months of 2014. Overseas investment in the country went from about $4 billion in the first 10 months of 2012 to $791 million in the same period this year. That cost the previous prime minister his job and gives Saikhanbileg a chance to convince the foreigners to come back. Oyu Tolgoi and Rio Tinto's majority control of the mine became politicized when backbench lawmakers began questioning the ownership structure. The issue then became part of election platforms warning that foreigners were pillaging the country's mineral wealth. A 2009 Investment Agreement gave 66 percent of the mine to Vancouver-based Turquoise Hill Resources Ltd. (TRQ) and 34 percent to the Mongolian government. Rio controls the project through its majority ownership of Turquoise Hill. Relations between the two owners turned nasty in 2013 as construction costs for the phase one surface pit went over budget. Then they got worse in wrangles over taxes and the number of locals in management. Oyu Tolgoi's bank accounts were frozen at one point. The disputes have held up about $4 billion in project financing for the underground phase of the mine, where most of the copper and gold is. Getting the project moving again will require the signing of a Memorandum of Understanding declaring all past issues resolved. The prime minister said he'll need to brief Parliament on his plan and seek political backing from his government and that will take some time, Byambasaikhan Bayanjargal, chairman of the Business Council of Mongolia, said on Dec. 10. Dec. 12 (Bloomberg) -- Tromans steps down as president and CEO effective Dec. 12, according to a statement to Hong Kong stock exchange. TORONTO, ONTARIO--(Marketwired - Dec. 12, 2014) - Khan Resources Inc. (CSE:KRI) ("Khan" or "the Company") announced today that it has filed its financial statements and management discussion and analysis for the year ended September 30, 2014 on SEDAR and has posted these documents to its website www.khanresources.com. · International arbitration action against the Government of Mongolia - All submissions and hearings have been completed in respect of the international arbitration action against the Government of Mongolia for the illegal expropriation in 2009 of the Company's mining and exploration licenses for the Dornod uranium project in northeastern Mongolia. The hearing on merits and quantum was completed between November 11 and November 15, 2013 and two post-hearing briefs were subsequently submitted; the first on February 5, 2014 followed by a final brief on April 11, 2014. The Tribunal is now in the process of formulating their decision that is expected in the next few months. The amount of damages sought by Khan currently exceeds $350 million. · Cash - Substantial cash outflows for legal expenses related to the international arbitration came to an end by March 31, 2014. Management is now conserving its cash resources pending the decision by the Tribunal. The Company's rate of cash expenditures has declined significantly since April 1, 2014. · Investments - At September 30, 2014, the Company held 14.4 million common shares of Macusani Yellowcake Inc. ("Macusani") with a fair value of $939,000 (2013- $1,164,000). During the year, the Company sold 1,081,000 shares (2013 - nil) for gross proceeds of $114,000. The Company's holdings represent 5.5% of the 259.7 million Macusani outstanding common shares. · Corporate matters - The Mongolian subsidiaries were closed on September 30, 2013 and all Mongolian tangible assets were retired. The office in Ulaanbaatar was closed on June 30, 2014. The following table summarizes financial results of the Company for the fourth quarters and the years ended September 30, 2014 and 2013. 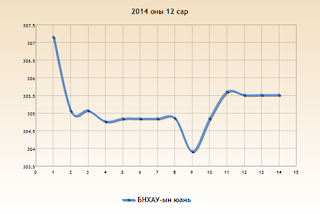 Ulaanbaatar, December 12 (MONTSAME) Five stock trades were held at Mongolia's Stock Exchange December 8-12 of 2014. In overall, 40 thousand and 406 shares were sold of 31 joint-stock companies totalling MNT 254 million 649 thousand and 875.00. "Hai Bi Oil" /21 thousand and 602 units/, "Merex" /2,775 units/, "Khokh gan" /2,745 units/, "Ninse HK" /2,615 units/ and "Genco tour bureau" /2,162 units/ were the most actively traded in terms of trading volume, in terms of trading value--"Hai Bi Oil" (MNT 12 million 839 thousand and 240), "Tav" (MNT eight million and 020 thousand), "APU" /MNT six million 737 thousand and 461/, "Bayangol hotel" /MNT five million and 858 thousand/ and "Gobi" (MNT three million 387 thousand and 355). December 11 (Bank of Mongolia) On the Foreign Exchange Auction held on December 11st, 2014 the BOM has received bid offer of 34.1 million USD at average 1,885.21 MNT and 30.0 million CNY at average 305.61 MNT from local commercial banks. The BOM has sold 12.0 million USD and 20 million CNY. On December 11st, 2014, The BOM has received USD SWAP agreement ask offer of 180.0 million USD and accepted all offer. Dec. 11 (Bloomberg) -- Mongolia National Statistical Office issues report on its website. Dec. 11 (Bloomberg) -- Mongolia exports of copper concentrate rose to $2.29b in the first 11 months of 2014 from $851m yr earlier, National Statistical Office says in website statement. According to report of the Bank of Mongolia, money supply (broad money or M2) reached to 9.9 trill.tog at the end of November 2014, went down by 53.1 bln.tog or 0.5 percent from the previous month, while it went up by 0.8 trill.tog or 9.1 percent compared with same period of the previous year. At the end of November 2014, currency issued in circulation reached 769.0 bln.tog, went down by 40.7 bln.tog or 5.0 percent from the previous month while went down by 34.9 bln.tog or 4.3 percent from same period of the previous year. 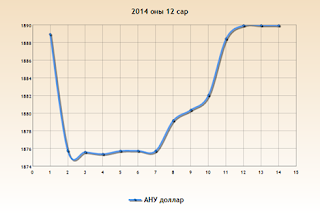 Loans outstanding 2014 amounted to 12.6 trill. tog at the end of November, decreased by 185.1 bln. tog or 1.4 percent from previous month and increased by 1.8 trill.tog or 16.9 percent from the same period of the previous year. Principals in arrears reached 444.7 bln.tog at the end of November 2014, went down by 5.9 bln.tog or 1.3 percent from previous month, while it went up by 283.6 bln.tog or 2.8 times compared with same period of the previous year. At the end of November 2014, the non-performing loans over the bank system reached 620.0 bln.tog, went up by 13.7 bln.tog or 2.3 percent from the previous month while it went up by 47.5 bln.tog or 8.3 percent from same period of the previous year. 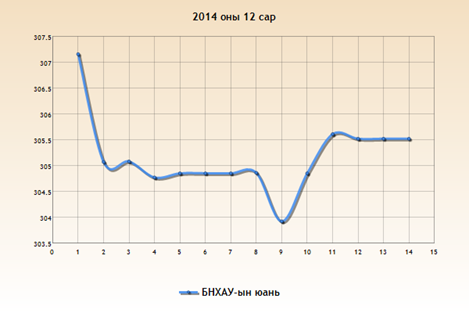 In the first 11 months of 2014, 44.4 mln.shares were traded valued at 168.3 bln.tog in the stock market. The securities trading was decreased by 153.0 bln.tog or 47.6 percent and shares decreased by 20.4 mln.shares or 31.5 percent compared to same period of the previous year. Fitch Ratings-Hong Kong-11 December 2014: Fitch Ratings has affirmed Mongolia's Long-Term Foreign and Local Currency IDRs at 'B+'. 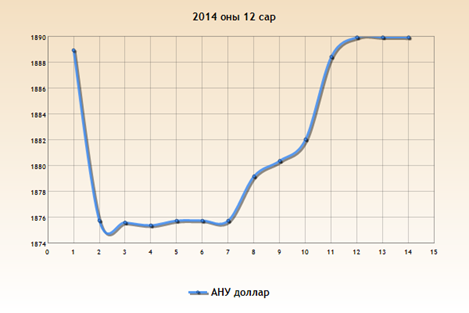 The issue ratings on Mongolia's senior unsecured foreign and local currency bonds are affirmed at 'B+'. The Outlooks on the Long-term IDRs remain Negative. The Country Ceiling is affirmed at 'B+' and the Short-term foreign currency IDR is affirmed at 'B'. The affirmation of Mongolia's IDRs with Negative Outlooks reflects the following key rating drivers. - Unstable Policy Environment: Prolonged commercial disputes between public officials and Rio Tinto have halted progress on the USD5bn Oyu Tolgoi Phase 2 copper mining project. To counteract the resulting slowdown in economic activity, policy makers have enacted aggressive monetary and fiscal stimulus measures that have had a destabilising effect on the economy. Growth has slowed, inflation has averaged 13.1% in 2014, foreign reserves have fallen by 41% year-on-year, FDI has contracted sharply, and a further 12% depreciation of the domestic currency year-to-date has worsened banking sector asset quality. - Weak External Liquidity: Mongolia's stock of foreign reserves is low at USD1.4bn as at end-October 2014, and it has effectively been debt-funded through external bond issuance and a swap arrangement with the People's Bank of China (PBOC). Reserve coverage is weak compared to peers at 2.1 months of current account payments versus the 'B' median of 3.4 months. Fitch believes Mongolia's aggregate external liquidity resources (defined as gross foreign reserve assets plus the estimated undrawn portion of the PBOC swap line) are barely sufficient to meet liquidity requirements over the coming two years, given current trends. - Positive Political Developments: The recent appointment of a new prime minister and the formation of a "super coalition" are broadly positive political developments, which Fitch believes have increased the prospects of a favourable resolution to the Oyu Tolgoi dispute. - High Public Indebtedness: Persistent fiscal deficits and sizeable off-budget spending through the state-owned development bank will result in Mongolia's public debt rising to an estimated 59% of GDP in 2014, significantly in excess of the 'B' median of 43%. Public debt has risen by USD3.7bn since 2011, which primarily represents a sharp increase in external debt issuance by sovereign and sovereign-guaranteed entities. - Sizeable Refinancing Risk: Rising dependence on external capital markets combined with a sharp decline in foreign direct investment (FDI) have exposed Mongolia's public balance sheet to significant refinancing risks. The sovereign has sizeable maturities due in 2018 (USD500m) and 2022 (USD1bn). The Development Bank of Mongolia has additional maturities in 2017 (USD580m) and 2023 (JPY30bn) that carry an explicit sovereign guarantee. - Favourable Development Prospects: Mongolia's long-term development prospects are supported by its generous endowments of coal, copper, gold, and rare earths, which have been estimated at USD1.3trn. A small population under 3 million also suggests that per capita incomes have the potential to rise dramatically if the country is able to successfully harness its natural resource endowments. - Strong GDP Growth: Mongolia's five-year average real GDP growth of 11.2% is far stronger than the 'B' median of 3.9%. The country also scores above its peer group in many structural features, including governance indicators, savings and investment rates, and per capita incomes. - Continued depletion of Mongolia's external liquidity resources. - Emergence of systemic financial stress such as a run on deposits and/or a flight out of the Mongolian tugrik into foreign currency. - A favourable resolution to the Oyu Tolgoi Phase 2 dispute between Rio Tinto and the authorities is likely to provide relief to many of Mongolia's credit constraints by unlocking sizeable FDI inflows, restoring investor confidence and alleviating refinancing risks. - Credible and coherent macroeconomic policy-making that increases confidence in Mongolia's basic economic stability. - Reported foreign reserve assets can be deployed to meet balance of payments requirements, in spite of the fact that they include holdings of non-convertible currency. - Mongolia maintains stable political and economic relations with China, its largest export destination and key provider of its international liquidity resources. December 12 (GoGo Mongolia) According to the National Statistics Office data as of November 2014 the average salary in Mongolia nationwide differs greatly by regions. While national average reaches 792,000MNT, this number goes up to 872,000 MNT in Ulaanbaatar city, with the same number declining to 580,000MNT in western region. Western Region covers Khovd, Bayan-Ulgii, Uvs, Gobi-Altai and Zavkhan aimags. With lowest average salary at national level, it implies the necessity of the Aimag Governors to work towards improving the situation; otherwise the population migration from these aimags might stay at highest for coming years. While capital city schools and hospitals are overflowed with children, aimag schools and hospitals operate with very low numbers. MPs elected from Western Region have asked multiple times at the Great Khural sessions to review the increase of the salary and social welfare at the region, but were declined citing the upcoming debt payments of the Government bonds. Another issue that catches the eye is the salary of the mining and exploration sector. This sector boasts with average salary ranging at MNT1.5 million. December 14 (UB Post) On December 11, MP and Minister of Finance J.Erdenbat submitted draft amendments to the law on the 2015 state budget, the law on the 2015 budget for the social insurance fund, and the law on 2015 human development fund to Deputy Chairman of Parliament R.Gonchigdorj. The draft was revised based on provision 34.1.4 of the law on budget, which states "a draft amendment should be processed when regulating the state budget". J.Erdenebat introduced that the expenditure of the social insurance fund increased by 21 billion MNT, but the operating costs were reduced by 0.1 billion MNT. The following amendments are reflected in the draft regarding the human development fund: the Prime Minister of Mongolia will serve as budget portfolio manager of the dividend accumulation funds, and the debt service payments of the human development fund will be increased by seven million MNT. The draft also includes increasing the approval of the payment of 2012′s released bonds by 21 million MNT, increasing the human development fund's prepayment by 81 million MNT, and releasing bonds of 320 million MNT. News.mn spoke with Chairman of the Standing Committee on Budget Ts.Davaasuren regarding the draft amendments to the 2015 state budget. The 2015 state budget was criticized for being inefficient. How is efficiency reflected in the amendments? The amendments don't really focus on efficiency. Around 900 positions were cut when approving the 2015 state budget and over 700 million MNT was saved. The changes made made in accordance with the new government's structure. During yesterday's [December 11] cabinet meeting there was talk of 51 billion MNT being saved? It includes various cuts. I personally don't agree with some of them. For example, reducing the leather production bonuses by 16 billion MNT is wrong. If we want to solve UB's population issues and air pollution, then we need to encourage citizens to leave UB and live in the countryside. There aren't any bonuses in the countryside, so people are heading to the capital. The new government's structure was approved, do you need to amend the state budget within 2014? Yes, it's necessary. When approving the 2015 state budget, three ministries were eliminated. The new ministries have to have budgets to begin the upcoming year, so the amendments need to be approved within December 2014. The number of ministries has increased. How are financial resources being estimated? The amendment includes only a few cuts and additions. The state budget is not finalized yet, so it's too early to talk about financial resources. December 14 (UB Post) Over 40 party candidates are in a race for seven deputy minister positions in PM Ch.Saikhanbileg's new government. According to the coalition government agreement, the Democratic Party was allotted five deputy minister seats, the Mongolian People's Party with seven seats, Justice Coalition (established by the Mongolian National Democratic Party and Mongolian People's Revolutionary Party) with three seats, and the Civil Will Green Party will have one deputy minister seat. Some candidates began promoting themselves before Parliament had approved ministers. This annoyed party leaders and instead of attracting party support, it has resulted in displeasure. The MPP proposed that the DP abstain from appointing deputy ministers from parties different from their minister, but the idea was rejected. This clearly shows that a DP minister could end up getting a deputy minister from the MPP, and an MPP minister could get a MPRP deputy minister, and so on. The most ambitious competitors seem to be coming from the MPP, and there seems to be a focus on supporting young men and women for candidates. Still, there is a group in government that thinks it's too early to step aside for young people. If party leaders are able to bring up young candidates, competition will become fierce between former MP J.Sukhbaatar, former CEO of the Mongolian Stock Exchange Kh.Altai, former Deputy Director of Erdenes Mongol LLC G.Temuulen, Leader of the Capital City MPP Committee Ts.Sandui, and Head of the Reform Committee of the MPP T.Ayursaikhan. Potential female candidates are former Deputy Minister of Education, Culture and Science and President of Bishrelt Group B.Undarmaa, former Deputy Minister of Mineral Resources and Energy B.Garamjav, MP B.Narankhuu's sister B.Saranchimeg, Deputy Director of the National Chamber of Commerce and Industry of MPP M.Oyunchimeg, MPP Secretary General Kh.Bulgantuya, and Chairwoman of the Social Democracy – Mongolian Women's Association Ts.Tsogzolmaa. In the case of J.Sukhbaatar, politicians saw him as a strong candidate for MPP Secretary General last year, but he was unsuccessful. In the end, he wrote a strong comment on Twitter, saying that the party will not be reformed as long as T.Badamjunai is in the MPP and referred to him as "briber". It's possible the MPP will nominate J.Sukhbaatar as candidate for Deputy Minister of Justice. Sources report that the son of former Director General of Erdenet Mining Corporation Ch.Ganzorig, G.Temuulen, is being considered for the Deputy Minister of Mining position. The strongest candidate for this position was actually Deputy Minister of Mining O.Erdenebulgan, but things changed as candidates were to be reshuffled from different parties. Former Deputy Minister for Mineral Resources and Energy B.Garamjav, current director of Mon Polimet Group, has also been nominated for this position. Former Deputy Minister of Education, Culture and Science B.Undarmaa will probably keep her position, as politicians claim that a new minister would lose too much time while reviewing and getting to know their new responsibilities. It seems there are many competitors for this position, but so far, it's unclear exactly who is interested. According to rumors, Chairman of the MPP M.Enkhbold wants to appoint one of his people, Chairwoman of Social Democracy – Mongolian Women's Association Ts.Tsogzolmaa, to one of the seven positions and form a strong faction in the city. The selection for each post will be finalized at the meeting of the MPP Board of Directors and MPP groups in the parliament. December 14 (UB Post) Rail transport is a driving force for the socio-economic development of any country. It used to be the case in Mongolia. The beginning of Mongolia's industrial development traces back to 1938, when coal was first transported to our first-ever power plant on a 42 km, narrow gauge railway from Nalaikh to Ulaanbaatar. In 1955, the northern border of Mongolia was connected to the southern border with a 1,115 km railway. In order to make the connection, a total of 508 bridges, 35 relay stations, five depots, and a central station in Ulaanbaatar, along with many villages that had residential neighborhoods, hospitals, schools, cafeterias, and stores. A 200 km railway to the Salkhit-Erdenet copper-molybdenum mine was completed in 1973. This was all built by Joint Stock Company Ulaanbaatar Railways (UBR), which was jointly founded by the Mongolian and Russian governments in 1949. Occupying a significant area within Ulaanbaatar, today UBR has a total of 1,815 km of railway, 17,000 employees, and is responsible for 60 percent of all nationwide freight turnover, as well as 50 percent of all rail passenger traffic. However, it has become a "kingdom" inside a nation by being too large, inefficient, unclear, and obstructing city traffic. There is a Mongolian saying that says "The time is never always the same, just like an iris does not always look blue", which means that times change. Not able to meet the needs of Mongolia's rapid development and lacking proper management and technology, UBR has spent 20 years (since the 1990s) conflicting with the normal ways of doing things in a market economy, and has turned into a shackle that impedes economic development today. If UBR had acted sensibly and adapted to the changing needs of a market economy, Mongolia's total freight turnover and passenger traffic would have grown significantly. UBR resembles a dog sitting on a bundle of hay, not eating the grass while refusing to share it with others. The main reason why UBR has become a bottleneck, hindering development, is that they have a natural tendency towards monopoly and are fully separated from the market economy because of the bilateral agreement between the two countries. UBR is the only economic entity that does not pay taxes while operating on Mongolian soil. Their operations are governed by an outdated agreement established by the two governments, one that has already completed its historical purpose. UBR is not compliant with Mongolian laws and the constitution regarding companies, registration, fair competition, and land. Other countries have already adapted to international standards and norms. For example, Russia has been implementing the European Union directive 91/440, and changed their rail infrastructure to improve efficiency by separating the basic structure from the rail operator. Having the mindset of Erdenet, another joint company, Mongolia has lost 25 years talking about how to increase its UBR ownership from 50 percent to 51 percent, and has not taken it up with Russia. Mongolian political parties that acquire ruling power one by one, in turn, benefit from this economic entity being inefficient and barely coping with social pressures. It is almost as if the government wants to keep state properties as they are, so that they can appoint their own people in various positions, be in charge of management, keep ownership unclear, and establish goods and services contracts with their own companies. The countless meetings they have had around UBR have wasted an entire era talking about seats and positions rather than tackling the main problem and changing the JSC agreement. Mongolia's entire rail and road networks should be owned by the government, but managed and operated by private entities or public shareholding companies. Such ownership allows for competition and efficiency. Even if the infrastructure, such as roads, water supply, or power plants, were established jointly with another country, it must not be owned by another government. The infrastructure can only be used for a certain amount of time, but it should not belong to a foreign country. Mongolia will not be able to achieve development without reforming UBR by implementing international norms. It is time for us to take advantage of our geographical location and become the next Panama Canal and play an essential role in international rail networks. A magisterial route connecting China and Southeast Asia (two of the biggest players in the global economy) with Western Europe goes through our territory. This route offers rail transport that is cheaper and twice as fast as sea transport. One assessment proved that the Steppe Road, Mongolia's 2,200 km wide corridor, is twice as cheap as building railway, roads, natural gas pipelines, and power lines over the Altai and Khyangan mountains going around Mongolia. Mongolia has started pursuing a policy to handle transshipment services between two different gauge railways by connecting to our two neighbors with a gauge difference of 85 mm. A third country managing these logistics is not only efficient for Russia and China, but also the international market. In order to provide such a service, there is a need to build a new railway connecting Zamiin-Uud and Altanbulag. The numerous existing loops in railway routes go through the capital city, where more than half of our population is concentrated, while there are unclear issues of infrastructure ownership. They all point to the need to find a brand new solution. The existing railway has the capacity for transporting freight weighing 2,000 tons at a speed of 30 to 40 km per hour. It can transport a total of 20 million tons a year. If the planned 400 million USD are raised, the capacity can be improved by 75 percent, which will take the capacity to 35 million tons a year. However, it will still prove to be insufficient in five years' time, when the demand will reach 100 million tons. To fully meet this demand, a feasibility study was developed seven years ago to build a 1,085 km railway that goes around downtown UB to the south of Bogd Mountain at a speed of 120 km per hour, and with the capacity to transport 6,000 to 10,000 tons of freight. On top of that, there is a need to do the necessary assessments for building a terminal where freight can be transshipped in Tuv aimag. The new railway transit project ought to start immediately. Parliament has recently issued a decision on a new railway route from Erdenet to Kyzyl, going through the Ovoot, Ovoot-Arts suuri, and Tsagaan Tolgoi ports. This decision should be implemented soon and the concession process must be sped up. As Mongolia is having political and economic dialogues with its two neighbors and discussing joint mega projects, it is a favorable time for our government to take the initiative with aligned policies and act with speed to continue the implementation of new railway projects. Railway has to be the driving force behind Mongolia's rapid development. December 12 (infomongolia.com) On December 10, 2014, the first Cabinet meeting of the new Coalition Government chaired by Premier Ch.Saikhanbileg was held and the following issues were discussed and resolved. - A children's hospital to provide medical care and services with capacity of 150 beds is resolved to establish under the Ministry of Health and Sports. The hospital will be accommodated in one of the state-owned buildings and intends to open within February 01, 2015, where Minister of Health and Sports, G.Shiilegdamba is obliged to manage preoperational and organizational issues. Moreover, Finance Minister J.Erdenebat is requested to allocate required financial sources. - Minister of Mining R.Jigjid introduced the implementation of the Decree No.216/2014 on "Regulation on selection processes to re-allocate 106 special licenses for exploration and exploitation purposes that earlier were suspended by court decisions". - The Governments of Mongolia and Austria had established an Agreement on Financial Cooperation on November 28, 2011 to implement several projects and programs. Under the Agreement, Government of the Republic of Austria shall allocate a soft loan of 40 million EUR to co-implement projects in infrastructure, education, health and social protection sectors. Within the scope of the projects, it was cited in the Agreement to import equipment and supplies freeing from customs tax. Accordingly, at the Cabinet meeting it was resolved to submit a draft bill to the State Great Khural (Parliament) on tax-free import of equipment and supplies of relevant projects. Also, the Ambassador Extraordinary and Plenipotentiary of Mongolia to the Republic of Austria G.Batjargal is entrusted to co-sign the Export Credit Agreement between the two countries under the Financial Cooperation Agreement. - Minister of Foreign Affairs L.Purevsuren is requested to submit the visit summary of the President of Mongolia conducted to Beijing to the National Security Council of Mongolia. President Ts.Elbegdorj attended the Asia-Pacific Economic Cooperation (APEC) Third Senior Officials meeting held in Beijing, China on November 08-11, 2014. ULAANBAATAR, December 10, 2014 (World Bank)—A World Bank delegation led by Axel van Trotsenburg, World Bank Regional Vice President for East Asia and Pacific, and including Bert Hofman, Country Director for Mongolia, and James Anderson, Country Manager for Mongolia, concluded its visit to Ulaanbaatar today. The delegation discussed the current economic situation, the new government's initial thinking on their program and how the World Bank program could support Mongolia. The delegation was impressed by the candor with which the Mongolian counterparts assessed the economic situation and their resolve to address the underlying causes of the current macro-economic challenges. The delegation met with H.E. Prime Minister Ch. Saikhanbileg, H.E. Chairman of the Parliament Z. Enkhbold, H.E. Minister of Finance J. Erdenebat, and top officials from Mongol Bank, among others. In his meeting with the delegation, the Prime Minister laid out the broad policy framework to address the current challenges. During the meeting, it was agreed that the World Bank Group would work closely with the authorities on a support program for Mongolia. "This cabinet is a solutions cabinet. We will address the difficult issues at hand to maintain macroeconomic stability, restore policy buffers and revamp private sector investment and growth." Prime Minister Saikhanbileg said, "I welcome the support of the World Bank Group and the international community for our program. Their technical expertise and financial support can help in addressing the challenges that Mongolia currently faces." "I am confident that the new government led by Prime Minister Saikhanbileg, with support from a broad coalition of political leaders, is determined to tackle the current economic difficulties and take the necessary actions to ensure a sound macroeconomic base and to promote dynamic private sector development," said Mr. van Trotsenburg. "With this approach, Mongolia will be able to achieve sustainable growth and shared prosperity." December 11 (World Bank) A wise Mongolian proverb reminds us that "times are not always the same; the iris is not always blue." The changes to the Mongolian economy since my last visit here just over a year ago attest to the truth of this proverb. Then, the mining boom that spurred economic growth into double digits was still in full swing, and efforts focused on spending future profits or investing it in much-needed human and physical capital. Today, the boom times and accompanying euphoria seem long ago. Growth has slowed considerably, foreign direct investment has fallen and inflation remains in double digits as Mongolia grapples with decreasing foreign exchange reserves and a widening fiscal deficit. External factors, such as falling commodity prices and slower growth in Mongolia's trade partners, contributed. Such vulnerability to market forces is a risk facing all natural resource-led economies. Successfully managing the cyclical nature of a resource-driven economy requires tough fiscal discipline when times are good. In dealing with the inevitable ups and downs, resource-rich countries that maintain discipline during good times have more resources and options for when things turn bad. This is easier said than done, as no one wants to imagine at the height of a boom that the good times will end. But end they eventually do, and countries that have saved for the future better manage the ups and downs of a natural resource-driven economy. At the heart of such a strategy, however, is the need to build trust that the surplus from a natural resources boom will be used wisely and efficiently. Such trust is not easily attained, and all countries must struggle to retain it, but there are things that can be done. Deepening the progress that Mongolia has already made on governance will be essential. Strengthening transparency, managing conflicts of interest and fighting corruption all help to build the trust required for the necessary political and popular consensus to properly manage the natural resource-led macro economy. In the end, though, development is about people and the betterment of the living conditions of the population. Supporting greater diversification of the economy would not only help reduce the amplitude of the boom-bust cycles of natural resources, but would also strengthen the link between growth, on the one hand, and job creation, poverty reduction, and trust, on the other hand. The good news is that there are viable policy options to do so. Some countries such as Chile and Norway have shown how to successfully implement policies that optimize, in a transparent way, the impact of natural wealth for the population and over time. In addition, Mongolia can count on bilateral and multilateral parties such as the World Bank to assist in this effort. A diverse and growing economy, one that helps people rise out of poverty, one that ensures that Mongolia's prosperity is widely shared across the population, can again be within Mongolia's grasp. It will take a concerted effort in adopting a policy package aimed at restoring macroeconomic stability, improving regulatory reform, and enhancing international competitiveness. The pay-off of this effort would be an iris that turns blue again. On December 10th the prime minister, Chimed Saikhanbileg, officially announced the new coalition government's cabinet of 18 ministers, who all received accreditation from parliament. The cabinet spells out the balance of power within the "grand coalition" government that was formed at the end of November, incorporating the Democratic Party (DP), the previous main opposition Mongolian People's Party (MPP) and the Justice Coalition. The DP, as expected, is the dominant party within the cabinet, with nine posts in addition to the office of prime minister. The MPP has six and the Justice Coalition, which comprises the Mongolian National Democratic Party and the Mongolian People's Revolutionary Party, has three. This broadly reflects their position in parliament: the DP has 34 seats in the 76–seat legislature, the MPP 26 and the Justice Coalition 11. The important posts have been distributed evenly. The DP will control the portfolios for justice, foreign affairs, education, industry and mining. Meanwhile, the MPP receives roads, construction, labour, environment and finance. The Justice Coalition gets the Ministry of Defence and the health and sports portfolio. Some of these ministerial positions look like poisoned chalices: the Ministry of Finance, for example, will face tremendous pressures as the country undergoes a period of extreme economic stress in the next year or two, with a significant risk of banking and foreign-exchange crises. However, in practice it will be hard for any one member party within the grand coalition to tar another for unpopular policies, as steering the country out of its current difficulties will require close co-operation between the various government departments. In theory the grand coalition should allow the government to make the tough choices necessary to address the deep structural changes required to put the economy back on a sound footing. However, there is a high risk that the coalition could yet founder over disagreements between its component parties, or because of splits within the DP. Our forecast that the DP will continue to control all the main political offices until mid–2016, but that political stability is not assured, remains appropriate. We will, however, adjust our forecast to reflect the appointment of the new grand coalition. December 12 (news.mn) The national convention of the International Maritime Organization will be held for the first time in Ulaanbaatar, on December 15-19th. Mongolia joined the International Maritime Organization (IMO), a London based U.N. organization, in 1996. Present at the IMO National Convention will be U.N. Resident Coordinator and UNDP Resident Representative in Mongolia Sezin Sinanoglu and Minister for Roads and Transportation N.Tumurkhuu. In recent years there has been an increasing number of Mongolian students attending World Maritime University in Malmö, Sweden. Ulaanbaatar, Dec 12 (GoGo Mongolia) Connection works at the Amgalan Heating Plant to the grid of 110/10kV at its extension and airlines have been successfully finished. The works preparations were started on November 26th with the Secretariat order of the Ministry of Mining to assemble the technical committee to ensure the smooth transition. According to the committee decree, works of Amgalan Heating Plant connection to grid has been completed as of December 11, therefore allowing to run the test works for 72 hours to ensure the uninterrupted electricity supply for the heating plant. Connection to the grid further allows running test on the Heating Plant equipment and preparing it for utilization. Ulaanbaatar, December 12 (MONTSAME) State-owned entities that operate at the airport have held a meeting in frames of the "Friendly Ulaanbaatar" program. At the meeting were, representatives of the Border Protection Office, the General Customs Office, the General Authority for Specialized Inspection, the Ulaanbaatar Department for Tourism, and the administration of "Chingis Khaan" airport. They discussed the problems faced by the tourists and tour companies, their solutions, to speed-up the services, to improve the staff's communication and language skills, to strengthen the coordination of activities of the state-owned entities operating at international custom posts, and on eliminating the duplications of activities without degrading the auditory values. It is decided that, as a result of the meeting, the auditory duplications will be eliminated, costumers' assessments for the communication skills of service staff and will be developed, and overall specialized trainings will be held for the personnel. Ulaanbaatar, December 12 (MONTSAME) The Administration of Ulaanbaatar city and the Union of Mongolian Banks (UMB) will cooperate in increasing benefits of the financial management within the economic sector. A cooperation memorandum on it was signed Friday by S.Ochirbat, a Deputy Mayor of the capital city for urban development and investment affairs; and M.Bold, the UMB president. In accordance with the document, the sides will create the most effective and proper system for providing people with apartments, supporting small- and middle-sized productions and the state-private sector partnership. Moreover, measures will be taken in several phases to issue guarantee for those who are involved in mortgage loans and to render effective and adequate services to them with the programme on re-planning ger areas. December 14 (UB Post) The Ulaanbaatar Administration Board is reviewing possible changes to traffic restrictions today during its regular meeting. Some media outlets and social media have been reporting that traffic restrictions in Ulaanbaatar were halted last Thursday, as the extension of the restricted driving program had reportedly come to its end. Ulaanbaatar City Mayor's Office's official B.Tuvshintugs denied the public speculation and confirmed that traffic restrictions remain in place. "There is no deadline for the traffic restriction. Drivers will still be prevented from participating in the city's vehicle traffic once a week in the future. What we talked about changing was reducing the active hours of restriction, following the suggestions of residents, as the winter has come." He added, "The Ulaanbaatar Metropolitan Police Department requested applying the restriction from 8 a.m. to 9 p.m. on workdays, instead of the 7 a.m. to 10 p.m. schedule, as part of the public's request. We will discuss whether to approve the request on Monday at a meeting of the Ulaanbaatar Administration Board." It's our fourth edition of Gothamist's travel content, Gothamist Getaways. A few times a year, we'll have a week of posts featuring looks at travel, food, products and tips—near and far—for making your trips more enjoyable. So sit back, dream of your next journey and let us know if you have any hints for us—email travel@gothamist.com. December 10 (Gothamist) In his 1997 novel, The Wind-Up Bird Chronicle, Haruki Murakami writes, "Dawn in Mongolia was an amazing thing. In one instant, the horizon became a faint line suspended in the darkness, and then the line was drawn upward, higher and higher. It was as if a giant hand had stretched down from the sky and slowly lifted the curtain of night from the face of the earth. It was a magnificent sight, far greater in scale...than anything that I, with my limited human faculties, could fully comprehend." Though you're likely not going to witness such a thing in the nation's congested capital of Ulaanbaatar, you don't have to travel far from the city to get a hint of what Murakami describes. Daily flights into Chinggis Khaan International Airport are available from Beijing, Berlin, Seoul, or Moscow. There are a number of overland options as well, but one of the more interesting ways to get there is the Trans-Mongolian, a route of the Trans-Siberian railway. Originating in Moscow, the Trans-Mongolian traverses Siberia, heads south at Ulan-Ude, wends its way across the Gobi Desert, and terminates in Beijing. December 10 -- Mongolia's construction industry has become something like a maze. Those who are currently in the toughest position to find their way around are the government organizations and private sector entities that are in the construction business. A total of 34,000 apartments are ready for use today in Ulaanbaatar whereas approximately 180,000 families are dreaming of moving into more comfortable homes and seeking for apartments that suit their needs and financial resources. Those families are currently living in their felt-covered gers without access to pipe water and sewage systems. Having built all those apartments, construction companies are struggling to sell them while searching for ways to raise capital to pay off their debts. On top of that, 33,000 apartments are expected to be ready in 2015, and another 23,000 in 2016. The housing market has a surplus of apartments that do not meet the needs and purchasing power of people. Although the supply has already exceeded the demand, the prices are not going down, which has heated the economy quite a lot. In 2013, the Ministry of Road, Transportation, Construction, and Urban Development developed a sub-program to stabilize housing price and support the construction sector in cooperation with Mongolbank. In the framework of this program intended to stabilize the prices of main construction materials, soft loans worth 370 billion tugrugs have so far been provided to support the production of construction materials and their imports. Furthermore, in order to establish a long-term, sustainable structure of housing finance, housing mortgage worth 2 trillion tugrugs with an annual interest rate of 8 percent was provided to more than 20,000 families. In addition, loans worth 440 billion tugrugs were granted to construction companies with varying interest rates (7 percent in urban areas whereas 5.5 percent in rural parts). In total, 2.8 trillion tugrugs were printed by Mongolbank for the provision of loans through commercial banks to the construction sector. However, reviewing and monitoring have not been done well and transparent on how these loans were dispersed, what criteria were used, and what outcomes have been produced. For instance, Mongolian National Construction Association (MNCA) has not received any clear response to the letters they sent to Mongolbank requesting for detailed information about whom the loans worth 440 billion tugrugs were provided to. Housing loans comprise one third of loan portfolios at commercial banks today because the thousands of apartments that are ready for moving in have not been sold yet. The quality of housing loans has been diminishing and the bad loans are making up 3.4 percent of total loans today. It is highly probably that this percentage will reach 4 percent by the end of this year, which is the highest percentage that can be tolerated before it poses a very significant risk to the banking sector. In the recent months, commercial banks have started raising the bar to grant soft loans for housing. On the other hand, the economic decline has reduced the number of people whose employment allows them to pay the half of their annual income for housing loans. According to a study carried out by the Ministry of Road, Transportation, Construction, and Urban Development, a total of 203,000 households including the migrants who moved from rural areas to Ulaanbaatar are interested in purchasing an apartment whereas one third of them do not meet the requirements for the 8 percent housing mortgage. A survey done by the MNCA in January-April, 2014, says that 5,224 apartments were booked out of 34,406 apartments that were ready by then. A total of 903 one-bedroom apartments were booked out of a supply of 4,937, a total of 1,773 two-bedroom apartments out of 13,340, a total of 954 three-bedroom apartments out of 4,513, a total of 122 four-bedroom apartments out of 1,838, and a total of 21 five-bedroom apartments out of 422. Construction companies built more two-bedroom apartments expecting them to be in high demand. However, the number of two-bedroom apartments that were booked was eight times less than the supply, which can be explained by the location of those buildings, landscape, proximity to schools and hospitals, availability of social services, housing area planning, price, and quality of building. The sales of apartments with small areas, bad locations, or ones with an area larger than 80 square meters, especially the luxury apartments, have almost stopped. There are huge gaps between supply and demand in terms of apartment area, price, and other factors. The future of many housing projects does not look bright. A centralized plan for zoning and building apartments in Ulaanbaatar only existed on paper and has not been truly implemented. As a consequence, the senior management of our capital city has always been benefitting illegally through conspiracies to sell and buy land. Construction companies are still buying land at higher rates than an ordinary citizen would pay and are offering expensive prices for the apartments that are built and designed on their own and lack proper landscaping. The construction companies are assuming the role of owner, developer, seller, and user at the same time. It reduces the labor productivity and increases spending, which is one of the reasons why the prices are not going down. The apartment blocks from the Government Housing Corporation (GHC), which has its land granted for free and the infrastructure developed by the government, were the first to be sold out for their lower prices. They have been overbooked, which is having its impact on the sales of other expensive apartments. The main reason that the construction industry is lost in a maze is that the government does not have any doctrine or centralized policy for housing. The parliament ordered the government to develop such policy six years ago, however, those who had 'double deels' have been sitting back and postponing it. If there is a strict doctrine or policy, it would pose great difficulties to the decision makers who are associated with construction companies. Most construction companies acquire land in an unorganized manner and starts building despite the absence of general planning. Therefore, it is not clear when those buildings will be connected to central services and who will develop the infrastructure. In other words, they bury a huge amount of capital underground and wait for the moment to gain profits. The trade of land permits, open or secret, has gone out of control. As a result, many buildings, whether completed or not, are to be demolished. Due to the absence of a centralized survey or assessment of all projects in the construction sector, companies have relied on their experience and historic trends to try predicting the market demand and prices. It has been many years since they started talking about the need to reform the obsolete construction standards complied in Mongolia. Such obsolete, mixed standards are benefitting many different parties. It is time for the government to pass a clear doctrine or policy to be followed in the construction sector, develop a plan to provide housing to people, and have it implemented by the private sector. There is a need to reflect on Singapore's experience and build single-design apartment blocks that have studios and one-bedroom apartments to be rented by lower income people along with buildings that have two-, three-, and four-bedroom apartments. More luxurious apartments with larger area should only be planned and built by the private sector. People could be enabled to use the money that has been accumulated for social insurance to purchase apartments. A housing and development board similar to what they have in Singapore can also be established. December 12 (infomongolia.com) On December 10, 2014, Director of the Department of Asia, Pacific Countries at the Ministry of Foreign Affairs of Mongolia, Mr. Ch.Bayarmunkh and Japanese delegation from the Foreign Ministry led by Director-General of the Asian and Oceanian Affairs Bureau, Mr. Junichi Ihara held a politico-military meeting on Mongolia-Japan foreign relations, defense and security issues in Ulaanbaatar. During the meeting, parties exchanged information and views on bilateral relations and cooperation as well as issues concerning in Asia-Pacific region, where officials from National Security Councils and the Ministries of Defense of the two countries were present. This politico-military meeting has been organized since 2013 within the aims to strengthen Mongolia-Japan strategic partnership. On the same day, Minister of Foreign Affairs Lundeg PUREVSUREN received the visiting Japanese delegation and at the beginning meeting Director-General of the Asian and Oceanian Affairs Bureau Junichi Ihara congratulated the newly appointed Foreign Minister L.Purevsuren and noted the partnership between two countries have been developing at all sectors. Moreover, Mr. Ihara expressed his satisfaction that high-level reciprocal visits have been also activated and wished to keep this progress in 2015. In response, Foreign Minister L.Purevsuren mentioned about his last visit to Japan when he was accompanying the President of Mongolia Ts.Elbegdorj and expressed his satisfaction that the two countries principally reached a consensus on establishing an Economic Partnership Agreement (EPA). Furthermore, Foreign Minister affirmed that Mongolia has been accomplishing local preparation works on signing the EPA to be organized in the near future. Ulaanbaatar, December 12 (MONTSAME) A meeting for enhancing Mongolia-S.Korea cooperation in energy and minerals was held on December 10 at Soyombo Hall of the Tuushin Hotel. It was initiated by the Embassy of the Republic of Korea in Ulaanbaatar and of other S.Korean organizations. State Secretary of the Ministry of Energy D.Delgertsogt took pane at the meeting and said that reliable and continuous provision of energy is an integral part of the country's security. Installed capacity of Mongolia's power sector is over 1000 MW, and 79 percent of which is covered by coal-burning thermal stations. Statistics show that the total power production in 2013 was 5123 million kW which indicates 5.7 percent increase against the previous year; that 97 percent of which was produced by the thermal power stations, 1.7 percent, by renewable sources; and that the country imported 1190 million kW of electricity, he informed. "However, Mongolia has been at power deficiency since the rapid expansion of extracting and processing in the mining industry" said the State Secretary. He also emphasized the necessity to obtain a reliable investment for the construction of the Fifth thermal power station of Ulaanbaatar, large capacity water power station to serve as a system moderator, and of a supertension power grid, in order to meet the excessive demand. Mr Delgertsogt highlighted the collaborations of the S.Korean professional energy companies on the projects being implemented in a scope of the above goal, mentioning POSCO and DAEWOO's efforts in the implementation of a project for building the Fifth thermal station with 450 MW per year capacity. Korean Energy and Economics Institute (KEEI) and Korgaz together with Mongolian Energy and Economics Institute and Energy Development Center inked a Memoradum of Cooperation, in frames of which the experts cooperate in academic researches. Mongolia cooperates with the Republic of Korea within the scope of the APEC, has joined the initiative "Asian Energy Highway", and has set up a research group to achieve the objectives in scope of the initiative. December 11 (U.S. Embassy) The U.S. Embassy in Ulaanbaatar is pleased to announce that Mongolia has been selected by the United States Millennium Challenge Corporation (MCC)'s Board of Directors as eligible to develop a second MCC compact. Mongolia's first MCC compact -- a five-year, $285 million infusion of targeted development assistance from the United States -- was concluded on September 17, 2013. The Chief Executive Officer of MCC, Dana Hyde, informed senior Mongolian officials of Mongolia's repeat selection via phone calls yesterday. The goals and terms of the second compact will be negotiated between the governments of Mongolia and the United States in the coming months. When considering whether a country should be awarded a second compact, the MCC considers many criteria, including whether the first compact was implemented effectively, the extent to which democratic policy development and implementation has improved over time, and whether needed sectoral reform has become a national priority. MCC's annual policy indicator scorecards are a compilation of government's performance statistics measured against internationally accepted standards for ruling justly, fostering economic freedom, and investing in people. This year, Mongolia passed scorecard benchmarks for the majority of indicators. The U.S. government, via MCC, looks forward to working with the Government of Mongolia to meet the challenge of translating Mongolia's continued economic growth into inclusive, poverty-reducing development. Ulaanbaatar, December 12 (MONTSAME) The President of Mongolia Ts.Elbegdorj has called Ms Dana J. Hyde, CEO of the Millennium Challenge Corporation (MCC). The President has expressed thanks to Ms Hyde for informing that the MCC has chosen Mongolia as a possible country to implement the second phase of the Compact Agreement, on behalf of the Mongolian government and people. Noting that the first phase of the Compact Agreement was successfully realized in Mongolia between 2008 and 2013, Mr Elbegdorj has emphasized the MCC's decision which expresses a common goal of Mongolia and the USA will fortify the bilateral relations and cooperation. He hoped that the Compact Agreement's second phase will significantly contribute to reducing the poverty rate and increasing the economic growth of Mongolia. The government of Mongolia will fully support ensuring of the agreement's implementation. December 12 (infomongolia.com) The newly appointed Minister of Defense Tserendash TSOLMON hosted his first reception meeting with the Ambassador Extraordinary and Plenipotentiary of the Russian Federation to Mongolia, Mr. Iskander Kubarovich Azizov on December 11, 2014. During the meeting, parties emphasized the successfully developing cooperation in defense sector between the two countries and exchanged information on measures implemented in 2014 as well as further tasks and directories to carry out in military technical cooperation in 2015. Moreover, Defense Minister Ts.Tsolmon underlined that the Mongolia-Russia traditional friendly neighborhood relations and partnership in defense sector are considered priorities and affirmed that Mongolia will be jointly celebrating the 70th anniversary of Victory in the Great Patriotic War 1941-1945 in 2015. New Defense Minister Ts.Tsolmon was accredited on December 10, 2014 and Premier Ch.Saikhanbileg conferred the Ministry's stamp, where preceding Minister D.Bat-Erdene and the Ministry staff were also present. December 12 (news.mn) The regular meeting of the General Council of Mongolian-Russian Ulaanbaatar Railway JSC convened in Ulaanbaatar on December 11th. The late night meeting is to continue for its second day today, to discuss the key agenda items. General Council members representing Mongolia and Russia are discussing issues on the JSC's fulfillment of financial planning in 2014, a transport and shipment plan for 2015, and technology innovation in Ulaanbaatar Railway. There is speculation that the appointment of a new head of Ulaanbaatar Railway JSC, replacing current Acting Head G.Sereenendorj, may take place. But a reliable source commented on the appointment issue, confirming, "The appointment is not included on the list of issues to be discussed. The General Council is now talking about the scheduled issues." The General Council of Ulaanbaatar Railway JSC is comprised of members who represent the Russian side, Head of the General Council of Ulaanbaatar JSC and the First Vice President of Russian Railways V.N. Morozov, Deputy Minister of Transport of Russia A.Tsydenov, and a representative of Russian Railways to Mongolia V.V.Morozov; and from Mongolia, Chairman of the Coordinating Department of Railway and Maritime Policy of the Ministry of Roads and Transport Yo.Manlaibayar, Director of Economic Partnership and Aid Policy Department at the Ministry of Economic Development D.Boldbaatar, and President of Mongolian Railroader's Association G.Vandandagva. Ulaanbaatar, December 12 (MONTSAME) A plenary meeting of the parliamentary session on Thursday discussed a draft law on ratifying the Optional Protocol to the Convention against Torture and other Cruel, Inhuman or Degrading Treatment or Punishment (OPCAT). Submitted by the government on July 8, 2014, the bill's report was presented at the plenary meeting by D.Dorligjav, the Minister of Justice, and proposals and views from the joint meeting of the Standing committees on security and foreign policy and on justice were delivered by N.Enkhbold MP. After running Q&As, majority of MPs (94.4%) backed to ratify the OPCAT. The OPCAT is a treaty that supplements to the 1984 United Nations Convention Against Torture. It establishes an international inspection system for places of detention modeled on the system that has existed in Europe since 1987 (the Committee for the Prevention of Torture). The OPCAT was adopted by the United Nations General Assembly in New York on 18 December 2002, and it entered into force on 22 June 2006. Ulaanbaatar, December 12 (MONTSAME) Such a club has been established at the initiative of the young personnel of the Ministry of Foreign Affairs. An opening ceremony was held at the ministry to mark the start of the activities on December 11. The Young Diplomats Club aims at developing the skills of young cadres in the diplomatic services, keep the succession of previous generations, improving social ambitions of young diplomats, constant interaction with the diplomatic missions in Ulaanbaatar, and facilitating an environment for collaborative development. A total of 84 members, 11 of which are included in the Adjustment Council, and a head and vice-head has been selected to the Club. The Club adopted its rules and structure on a meeting of October 31. December 14 (UB Post) At the Cabinet meeting held on December 10, the government resolved to submit a draft law for Parliamentary discussion to exempt imports of equipment, facilities and supplies for projects being implemented through a soft loan from the Austrian government from Mongolian customs tax. The governments of Mongolia and Austria established a financial cooperation agreement to implement several projects and programs, on November 28, 2011. Under the agreement, the Austrian government agreed to grant a 40 million EUR soft loan to cooperatively implement several large scale projects in infrastructure, education, healthcare, and social protection. The agreement includes a clause to exempt the equipment, facilities and supplies to be imported within the scope of the projects from Mongolian customs tax. The agreement also calls for financing a facilities and equipment modernization program for large state-owned hospitals, the introduction of new technology to upgrade Ulaanbaatar's water and sewer pipes without digging trenches, and a project to improve the capacity of fire fighting facilities and the equipment of emergency management agencies. Also resolved at the Cabinet meeting was the assignment of Ambassador Extraordinary and Plenipotentiary of Mongolia to Austria G.Batjargal to sign an export credit agreement for the projects to be implemented in the scope of the financial cooperation agreement. Providing the large state-owned hospitals, which have not undergone substantial modernization in recent years, with new facilities and diagnostic equipment is expected to allow the hospitals to carry out cancer radiation therapy, organ transplantation and laparoscopic surgeries, the diagnosis and treatment of cardiac catheters, and hemodialysis treatment conforming to international standards. December 11 (Bloomberg) A 17th century Mongolian bronze figure was sold for 3.46 million euros ($4.3 million) at an auction in Paris today despite the Mongolian government's efforts to block the sale. The statue of female Buddhist deity Tara came from the workshop of the 17th century artist Zanabazar, and Mongolia suspects it may have been removed to France illegally, Culture Minister Luvsannyam Gantumur wrote in a letter yesterday. The figure was expected to fetch up to 300,000 euros. Mongolia hasn't allowed the sale of Zanabazar artworks since the 1920s, and Sotheby's (BID) should determine the item's provenance "due to possible legal consequences," Gantumur wrote to Sotheby's France Chief Executive Officer Guillaume Cerutti. The statue, which Sotheby's describes as a "very rare and important gilt-bronze figure," was set to go on sale at 10:30 a.m. in Paris as part of the Arts d'Asie auction today. Sotheby's France spokeswoman Alexandrine Hawawini declined to comment on Mongolia's claim, and confirmed the sale amount. According to a brochure, the statue was acquired from Jean-Claude Moreau-Gobard in Paris in 1954. December 14 (UB Post) Mongolia's new ministers were appointed on December 10. The former Ministry of Culture, Sports and Tourism (MCST), established during the Reform Government, has now been split and integrated into other ministries at the orders of the new Prime Minister Ch.Saikhanbileg. Former Minister of Culture, Sports and Tourism and MP Ts.Oyungerel gave an interview regarding the appointment of new ministers. You've been managing the MCST for over two years. Unfortunately, the government was reformed and the ministry has been shut down. Can you comment on this? Last Tuesday morning, I gathered all staff at the ministry and passed my work to the three new ministers. First, Minister D.Oyunkhorol came. We weren't able to present all the works completed in the past but we separately introduced works that have started and all necessary works that need to be continued. Particularly, draft laws about tourism, casino, and carousel; development plan for a national tourism program; and communication, paperwork, payments, and major decisions made in the past two years within the scope of Mongolia participating in the world's largest trade show for the travel industry, the ITB Berlin 2015. I delivered data about a website for promoting Mongolia to international tourists, and documents as well as yearly travel calendars for promoting Mongolia to foreign markets. The Calendar for 2015 has to be developed in December. I advised that it's more effective if the management for tourist attractions and sites are consistent to environmental policies. Like so, I handed active works, investments, regulations, and documents prepared for national and governmental programs. Afterwards, I introduced previous and currently active as well as planned works for the sports sector to Minister of Health G.Shiilegdamba. I emphasized that the sports sector should be focused on supporting and encouraging events and measures, rather than jotting down highlights of the sports sector on paper. As it's effective to select sport teams and athletes and support together with [sports] associations, I mainly discussed about how to work professionally. I've also briefed about pending works for previous competitions for the Olympics, and the process for pursuing awaiting investments for sports venues and documents for draft laws for sports sector. I requested all the ministers to pay special attention to the low salary and neglected social issues of our sector. How confident are you about the new minister not neglecting the sports sector? Minister G.Shiilegdamba seemed to be confident that the attention on sports sector will not be reduced. I requested the new minister to keep the current sports team as they have been selected from a completely honest and fair selection process, without influences from some party or acquaintances. Workload for the Ministry of Health will increase immensely. Adding sports sector while the ministry is barely coping with the current work will escalate workload. Government work will progress smoothly if a professional team works and the sector isn't pushed out of focus. I'm concerned about the high attention previously put on the sports sector would become weaker. Will former employees who were under your management keep their position? I introduced the staff from each sector to the ministers and handed their materials. All three ministers informed that they would review the structures of their newly constructed ministries. They said that job positions within the structure will be finalized after discussing with the Ministry of Finance and the government. Currently, it's unclear where employees at out ministry will be reassigned. I'm expecting them to work at ministries of their respective sector. The issue to liquidating the MCST has been raised since the former PM N.Altankhuyag suggested a structural change but was dismissed. Isn't it regrettable that the ministry has been shut down in the end? Indeed, it's regrettable. All three sectors combined together to promote Mongolia and increase awareness when they were under the same roof. It's unfortunate that this process will be split to different routes. Still, the government resolution must be fulfilled. We're not doing our personal work. In a democratic government, works must be changed according to decisions to reform the government. No matter how the government functions, cultural, sports and tourism issues shouldn't be neglected or forgotten. I'm satisfied that the three ministers reviewed former works for each sector, perceived the amount of time and effort spent on them with their own eyes. The MPP collateralized the V.I.Lenin Museum in Mongolia. Has this issue been resolved? The V.I.Lenin Museum became a state-owned property, was registered in the real estate registration, and received its land certificate. It has undeniably become a state property. Now, officials are discussing if a state property can be used as collateral for an individual's loan. We appealed to the court that this sort of act shouldn't be permitted. This work was passed onto the next minister. It's included in the 41 work reports I handed in. Several members of the MPP claimed the MCST was useless and should be shut down. Could this be a revenge for declaring the V.I.Lenin Museum, previously owned by the MPP, as a state property? I don't wish to comment on this. I completed a work of the government. I registered a state property as the state's because the state didn't privatize, trade, or gift it. I wouldn't have appealed if it had been privatized. At the time, MPs, employees of the National Circus and local residents were requesting me to return the National Circus to the state. I was solid on the fact that the state shouldn't reclaim a property that's been privatized. The V.I.Lenin Museum was a state property and I worked to register it to its rightful owner [the state]. Nobody should be accounting on this. Since the process was conducted transparently before everyone, I guess you can express your disapproval. You were able to discover the trade network that was illegally smuggling cultural heritages to foreign countries. It must have been difficult to expose this trade secretly conducted for many years, right? As if they had known the MCST would get shut down, three large science magazines of the world praised our ministry in their magazine, just recently. The articles mentioned that Mongolia was taking courageous steps in stopping illegal trade network for cultural heritages. They had published an article with my picture with a heading saying, "The Woman Who Saved Mongolia's Dinosaurs". This shows that Mongolia has become a strong country that can protect, stop and reclaim its cultural heritages from illegal trade networks. The ministry worked with a specific policy for this issue. In other words, we worked under the policy to find the final purchaser and attack. Or else, it would've been impossible to expose a network with so many trade procedures in just two years. Mongolia has been stopping illegal trades by cooperating with the Federal Law Enforcement in the U.S. to discover the final network that displays cultural heritages. A French company that couldn't be caught in the French market was exposed while trading Mongolian dinosaur fossil in an American market. That French company returned the Mongolian cultural heritages they had through their embassy. The Mongolian Embassy in France will receive dinosaur fossils to return to Mongolia and Minister L.Gantumur will bring it to Mongolia. It's extremely difficult to find the head of a network based in the European market. As it requires considerable amount of legal costs, we have to sign many agreements and bring back smuggled relics via donations through museums. We were able to negotiate this sort of agreement with a museum in Berlin. This agreement will be signed under the title of the new ministry. I believe that when this sort of signal is received, market prices will drop, interests for purchasing will lessen, and illegal trade will stop. People are opposing "Mongol Content" included in the draft law on culture, which hopes to increase Mongolian content in local media, as an attempt to silence private television broadcasts. Can you comment on this? This draft law was submitted last June. The time to discuss this issue happened to be arranged when the ministry was shut down. I was strongly demanded to submit this draft law since my appointment as the minister in 2012. I've even been invited for an interview on a national television broadcast in 2012 to talk about what should be done to [South] Korean films and foreign contents. I was invited after the initiative to increase Mongolian content transmitted through public media. Basically, the demand for this draft law lasted for many months. We spent considerable time on developing this draft law to ensure adequate calculation and research, and submitted it last summer. I'm not disappointed that the time for its discussion was arranged like this. It will not affect the television sector negatively. The draft law on culture only requests to broadcast Mongolian films on specific time. Even though you've been dismissed, will you be initiating, proposing and supporting draft laws for arts and culture as a MP? Ministers of Culture do give up their posts but they still work for the culture. Even now, former Minister of Education, Culture and Science Yo.Otgonbayar is working as the main support for draft laws on cultural heritages and library. Following his example, I will support the three ministers when an issue about culture, sports and tourism is raised in the future. I will work just like the previous statesmen. I'd like to wish good luck to the three ministers who received my work. Ulaanbaatar, Mongolia -- (ReleaseWire) -- 12/10/2014 -- Crystal Back Turtle is a beautifully-sculpted piece that doubles as a desk lamp. Now Lkhanaajaw has launched an indiegogo campaign to raise this start-up capital for manufacturing these items in bulk. With the holiday gift-giving season upon us, here's a truly unique item. It's the Crystal Back Turtle, which functions as an attractive sculpture as well as stylish desk lamp. This elegant creation, made of wood or stone, is the work of Mongolian designer Bayarmunkh Lkhanaajaw, who sees the sculpted turtle as representing beauty and inner peace. "The turtle combines distinctive imagery and deep meaning," explained Lkhanaajaw. "This creature is the symbol of peacefulness and quietness. Therefore, we hope that Crystal Back Turtle will bring a feeling of comfort and rest. "In the animal kingdom, the turtle is slow but it is also mellow and kind. The turtle respects the environment and the creatures that live in it. This is the message I'm trying to convey with this piece." The Crystal Back Turtle is distinctive as well as practical. It has an empty space on top of its shell where a bulb and a beautiful crystal are inserted. The light emanates from the crystal, creating an enchanting aura. It operates on electricity from a wall outlet or a rechargeable battery. "This makes an excellent gift for the holidays or any other occasion," Lkhanaajaw said. "It really adds something special to a room, whether you're using the light for reading or work, or just as a decorative item." Lkhanaajaw has produced several Crystal Back Turtle prototypes and would like to manufacture these items in bulk so that more people can enjoy them. In order to do so, he needs $50,000 for materials, tools, special machinery and marketing. Those who would like to support this project are welcome to make a donation of any amount. For a $350 contribution, you can receive a wooden Crystal Back Turtle. The stone turtle is available for a $550 pledge. Bayarmunkh Lkhanaajaw is a Mongolian designer. He designed Crystal Back Turtle. Now he launched an indiegogo campaign to raise fund for this elegant creation. December 14 (UB Post) A child brings happiness and brightness to any home. Since ancient times, Mongolians have valued children and have spent very precious time raising and educating them. But nowadays, we are unaware of how to treat them. Among children's biggest difficulties, I am happy to be talking about the challenges of adoption, because this issue only receives a small amount of the public's attention, and also because I am a child of adoption. According to the National Statistical Office of Mongolia, over 2,500 children were adopted by local families and brought them happiness. Looking at more comprehensive statistics, approximately 10,300 children were adopted from 2009 to 2013, out which 113 were adopted to foreign families. Organizations working for children in Mongolia attempt to arrange placement with Mongolian families rather than foreign families in order to keep children happy in their homeland. If it is impossible to place children with local families, they are considered for adoption by foreign families. But, this is easier said than done. Adoption is an issue that we have to consider carefully. Living in an orphanage at an age when it is crucial for a child to receive their family's love is a very delicate thing. Orphanage workers prefer placing children with someone who will love them. A child's whole life and destiny can depend on a successful adoption. There are so many reasons to adopt children. Sadly, some people look to make money off of children, to have many children to retire earlier (and receive state bonuses), to receive the "Famous Mother" medal, and so on. It is critical to complete the correct documents and address the District Governor's Office when filing for adoption. Many types of investigations and research have to be conducted to adopt a child. Head of the Child Protection and Service Department of the National Center for Children B.Javzankhuu said, "Currently, the government solves adoption issues according to its system. It is just a simple question of how to compose documents and how to resolve placement." Mongolian organizations need to pay attention to this simple structure, because changing a child's living environment affects a child's entire life. This is a really delicate issue of human rights. A very flexible and broad range of research has to be done. For example, very specific research on what age is most suitable for adoption, or at what age a child is best able to adapt to a new environment. There are many issues related to adoption. For example, what if adopted parents get divorced? Issues like this always can't always be foreseen, but this research has not been conducted in Mongolia. Who will supervise the child after adopted parents get divorced? Supervision includes paying attention to adopted children even after their adoption is finalized. There was one horrible case of a family who locked away their adopted children in a storehouse for many years. This was only one case that was uncovered, who knows if other such terrible things are happening without being noticed. The Child and Family Development Centers of 21 provinces and social workers from some soums conducted interesting surveys on the issue of adoption around the world. As a part of these surveys, it was discovered that children's rights organizations do not participate in the process of adoption. People seek children to adopt on their own and there is no nationwide registration system of children eligible for adoption in Mongolia. Because of this incomplete system, people rely on what they hear and mostly go to well-known orphanages. Adoption has to be carried out with the participation of law enforcement and legal organizations. How to live happily, how to study successfully, and to how to create good things all depend on a child's behavior. They do not grow up wanting to steal or do bad deeds. What leads some orphaned children to this life? We have seen and heard very heart breaking news around us. Not long ago one new mother left her baby outside and hoped that someone would take care of her child, but her baby could not survive the cold weather and died. Who is to blame for this? Is a new mother or father who did not plan their family the only ones to blame? We don't know how many children are delivered to orphanages and suffer because of uneducated and irresponsible parents. On the other hand, maybe children who grow up in an orphanage are luckier than children who grow up begging for money outside or those who start working at an early age. Children who live with their parents cannot know what emotional difficulties orphans face even after being adopted. Also, we don't know how many orphaned children or children living on the streets are kidnapped and trafficked. If we don't take this issue seriously, what future will our children be living for? All involved parties must be present to address the Governor's Office. Once a child reaches age seven, parents who are adopting a child must receive the child's permission for adoption. December 13 (GoGo Mongolia) Netflix's 10-part TV drama "Marco Polo" launched on 12 December. As we were reporting earlier, this series is featuring Mongolian Actor B.Amarsaikhan, Another interesting news is that Mongolian Ethnic music band Altan Urag was contracted for this series as well. Watch this space for some Altan Urag music throughout the 10 series. Unurmaa Janchiv, manager for Europe, negotiated and signed the deal on behalf of the band. This is their second Hollywood licensing deal. As you all know, Altan Urag music was previously licensed to be used on "Mongol", directed by Sergei Bodrov. Mongolian actors starred in the "Marco Polo" series. Other Mongolian throat singers and an ethnic band are also featured in the series. December 10 (News North Wales) OLD Colwyn adventurer Ash Dykes has been nominated for a prestigious adventure award. The National Adventure Awards are a celebration of the very best of adventure across England, Wales and Scotland and Ash was nominated by friends and family, in the categories Adventurer of the Year and Physical Endeavour, after his solo adventure walking across Mongolia. Ash, 24, said: "This means a huge amount, it's truly appreciated and I'm lucky to have the support by such generous people going to the effort in order to vote for the expedition I under took. "It was a tough challenge and it didn't go unnoticed, which is fantastic. "A lot has changed since the expedition, I'm writing a book about it and I'm now available to do talks in schools, colleges, universities and corporate events. I'm having my documentary looked at by a production company in London, in the hope to have it broadcast. "Soon I will be leading an expedition across Northern Mongolia, so if anyone fancies joining me on a nine day trek through extremely untouched regions in Mongolia, then contact me for further details. "I'm also looking at my next big expedition, it's looking like another possible world first record, but I can't reveal what it is just yet unfortunately." Ash has been visiting schools to give talks on his expedition, including his former school Ysgol Bryn Elian, and his UK Tour, Ash Dykes - Breaking Mongolia: The Lonely Snow Leopard, begins in March. Ash added: "The final public vote will open again on January 6, 2015, and those who have previously nominated can nominate again, as it is a separate voting process." December 12 (infomongolia.com) Mongolian delegates of Buddhist Center headed by His Eminence Khamba Lama of Gandantegchinlen Monastery D.Choijamts are attending the Sixth World Buddhist Supreme Conference being held in the Grand Hall of Buddhism in Kobe city of Japan on December 08-13, 2014. The Sixth Buddhist Summit is themed "How to contribute to world peace and serenity for humanity through Buddhism", where spiritual ambassadors from various countries are attending. Notably, during the Conference, the Head of Gandantegchinlen Monastery D.Choijamts is elected to chair the Sixth Buddhist Summit, which is the first nomination from Mongolia. Head of the Mongolian Buddhist Center D.Choijamts used to serve as the Second Khamba Lama at the Gandantegchinlen Monastery in 1986-1990, further promoted for Da Lama in 1990-1992 and since then His Eminence has been serving as the Senior Khamba Lama. The young man studied at the seminary of Daejeon, South Korea. The local bishop, Mgr Lazzaro You Heung-sik, and Ulaan Baatar's prefect apostolic celebrated the ceremony. In the homily, Saint Andrew Kim was mentioned as "the first of many" who "was also ordained in a foreign land." Daejeon, December 11 (AsiaNews) - The path to becoming a good priest "must be full of joy: joy for the calling, and especially joy for the proclamation of the Gospel. This way, one becomes a good shepherd and one can face all challenges," said in his homily Mgr Lazzaro You Heung-sik, bishop of Daejeon, during the ordination ceremony for eight new deacons, including Joseph also Enkh-Baatar, the first consecrated person in the history of modern Mongolia. Joseph, who has been in South Korea since August 2012, is not alone at Daejeon seminary. Another young Mongolian at the seminary received the vocation. "God sent you together," the prelate said, "so that you could fulfil his commandment to 'Love your neighbour as yourself'. It is a great commandment: to love; we must always keep it in mind. " Joseph's consecration "reminds me of the story of Saint Andrew Kim Taegon, the first saint and first priest in South Korea," Mgr You explained. "He too became a priest abroad, in Shanghai, and, like Joseph, Saint Andrew went back to his country bringing the seeds of the Gospel. We hope it will bear fruit. " In addition to the ecclesial, missionary and apostolic importance, this ordination has also great relevance from a practical point of view. Under the laws of the Republic of Mongolia, only Mongolian citizens can buy land to build places of worship and only they can lead religious organisations. Although quite tolerant vis-à-vis Catholics, Mongolian authorities have applied these rules rigidly to other Christian denominations, severely limiting their apostolate in the country. The latest figures show that Mongolian Christians - of all denominations - constitute little more than 2 per cent of the population. Most Mongolians are Buddhist incorporating local shamanistic beliefs and traditions. The proportion of atheists is very high with almost 40 per cent of the total. There are about a thousand Mongolian Catholics, but they have been able to create and develop over time a number of facilities for orphans, the destitute and senior citizens, as well medical clinics - in a country with limited health services - and several schools and technical institutes.